Spring has sprung and school is back in session for the students of the Asahigaoka Branch School. 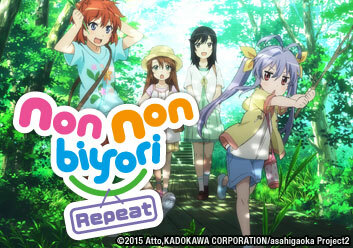 Renge prepares for her debut as a first grader with the help of her friends. New transfer student Hotaru adapts to life in the small town of Asahigaoka, and bonds with her classmates through an intense game of "drop-the-ruler." It’s test time and the students prepare for their exams with varying degrees of success. The girls band together to lend Natsumi a hand with her studies. Rain prevents Renge from testing out her new bike, so instead she searches for other ways to pass the time. Komari has a streak of bad luck after Natsumi uses a toy fortune dispenser to predict her fortune. Natsumi struggles to hold a conversation with Hotaru. A night of setting off fireworks doesn’t go as planned, and the girls must find an alternative. During a day at the river, Hotaru hesitates to dive in with the other girls. Hikage returns home from Tokyo and is forced to play with Renge. Nostalgia is in the air as the group reminisces about Renge's mischievous infancy, and Komari finds a stuffed animal from her early childhood. When Renge hears that her friends left training wheels behind in first grade, she becomes intent on learning how to ride her bike. Winter vacation is here, and all of the girls find different ways to spend their time before the new year begins. A year has passed since Hotaru moved to the town. The girls reflect on their time together as they get ready for a cherry blossom viewing.